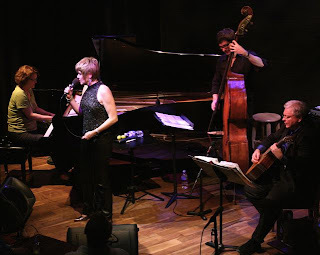 "A performance by vocalist and pianist Karrin Allyson is less a concert, more an exchange of confidences...." Click here to go to MinnPost for the rest of the review. No photos there. 6 "Sweet Home Cookin' Man"
How eclectic is that? She looked and sounded beautiful. 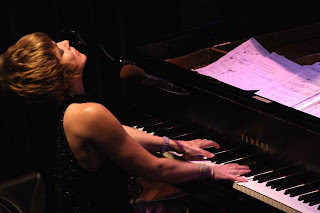 And her minimalist band--just Fleeman on guitar, Kohut on bass, occasionally Karrin on piano (and, in the photo below, her friend Laura Caviani sitting in)--was a perfect setting for a deeply personal evening of music.